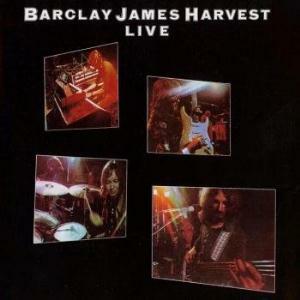 Barclay James Harvest’s Live (from 1974) is a phenomenal live recording, not because of its sound, which has some drawbacks of a shaky seventies recording that remain untouched (and rightfully so); but because it captures a seventies rock band in all its virtues: subtle, attentive to details, powerful and emotional. You need no more than one listen to "Mockingbird" to realize that. Barclay James Harvest is not as common name among progressive rock fans as you can expect. Perhaps it is because the band’s material is less elaborate compared to the works of Yes and Genesis; or maybe it is due to their correspondence with the more basic psychedelic and folk rock ("Summer Soldier" for example, might bring up a Neil Young comparison). If you know the original version of "Medicine Man" from their third album BJH And Other Short Stories, with it's length of about four minutes, you will be blown away by this extended 10 min + version found on here. It's the definitive version of the song and ranks as one of the truely brilliant epics of the first prog decade. Needless to say that almost all of the song versions found on here are beating the studio originals by a landmile in direct comparison. This release, however, is proof of the band’s terrific energy on stage and its raw authentic delivery, with a fired up rhythm section, scabrous guitar, vocals imbued with a sense of mission, and a mellotron setting the heavy, symphonic atmosphere. A highly recommended release for those of you who seek a flared encounter of progressive rock with its less tamed roots. If you are (like me) a mellotron-addicted, look no further than this masterpiece of a live album. It contains some of the most beautiful mellotron parts ever, since the mellotron completely overtakes the role of the orchestra, which is consistently present on the band's first couple of albums. Stuart "Wooly" Wolstenholm is a true master of this instrument and I would go so far to say that no other band in prog rock executed wonderful melodies with mellotron better than BJH, not even Genesis. They simply were THE melody-makers of the 70's (and possibly all time)! BJH live is one of the very finest prog live albums in history, so there's no sorry for not finding it in your collection. But make sure you get the 24 bit remaster of Eclectic Discs, released in 2005. The sound quality is so much superior to the original recording. It also includes all the song lyrics, a great addition for a live album!